In the video (courtesy Jewish News One), Ambassador Gutman says, "What I do see as a growing problem in Europe, as gaining much more attention in the newspaper, among politicians, among communities, among citizens, with a sense of alarm, is a far different phenomenon [...] It is the problem within Europe of tension, hatred, and sometimes even violence, between some members of Muslim communities or Arab immigrant groups and Jews. It's a tension and perhaps even a hatred largely born of and reflecting the tension between Israel, the Palestinian territories, and neighboring Arab states in the Middle East, over the continuing Israeli-Palestinian problem." U.S. State Department spokesman Mark Toner said Monday that Gutman would remain in his post. Toner said Gutman spoke as ambassador, yet expressed his own views. He declined to say if the administration disagreed with those views. The White House on Saturday condemned anti-Semitism in all forms. Amb. Gutman did as well. 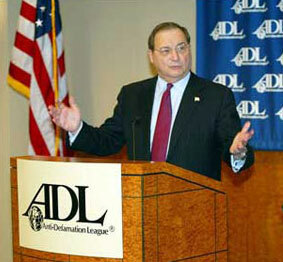 The ADL hosts its annual Dinner Celebration on Tuesday in Beverly Hills. We will give the ADL the opportunity to provide further information from there. Palestinians as victims is getting old. IMO It is a too bad thing people allow themselves to be used as pawns and raising their children to hate. Islamic antisemitism when they can't even keep from killing their own is just sad. I'm so damn tired of the blood and violence. Israel is the only island of sanity in the whole area.